Learn how PaymentSpring supports your specific industry and what we can do to take your efforts further. Build the payments solution that’s right for your business. Take your nonprofit further with donation collection solutions that go where you need to be. Quickly integrate a payments solution to your platform. Provide your clients with a simple payments solution and earn money doing it. Payment acceptance solutions that fit every bill. For those of you in the business of goods, services, software and philanthropy—get ready for positive change. 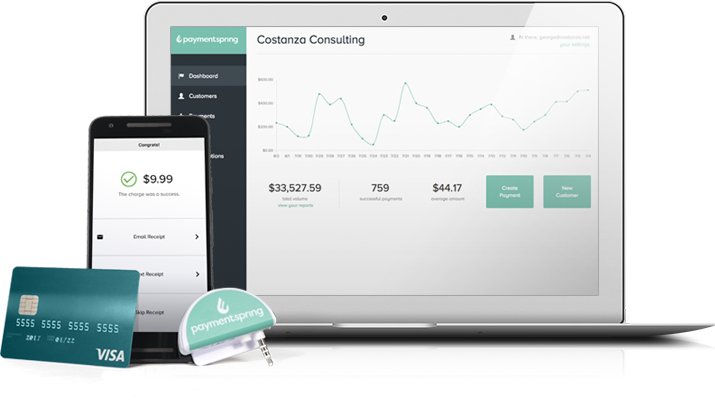 The PaymentSpring Gateway simplifies payment processing by funneling sophisticated solutions through one seamless channel. Your mobile and online transactions live here, together, because consolidating after the fact is redundant. And a waste of time. Two things we want you to avoid. Have opportunity, will travel—with the help of our free mobile app and free mobile card reader. You’ll find that things like recurring payments, electronic invoicing and quick payout turns are just the beginning of our service commitment. We believe shared success lasts much longer and is more favorable than one-sided relationships.